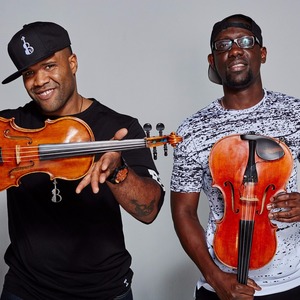 Named after an album by swing era violinist Stuff Smith, Black Violin is a violin and viola-playing hip-hop duo from Florida consisting of classically trained musicians Kevin Sylvester (Kev Marcus) and Wilner Baptiste (Wil B), who incorporate a variety of music genres into their distinctive string fare. The pair met as high school students in a Fort Lauderdale performing arts program and formed the group after attending separate universities. Quickly gaining a reputation for their dynamic performance style, the duo received national exposure after and appearance with Alicia Keys at the 2004 Billboard Awards and winning the talent show, Showtime at the Apollo, in 2005. Amidst mixtape releases, they issued their eponymous debut album in 2008 and Classically Trained in 2012, earring support spots on tours for, among others, Wu-Tang Clan, Ciara, Aerosmith, and Kanye West along the way.